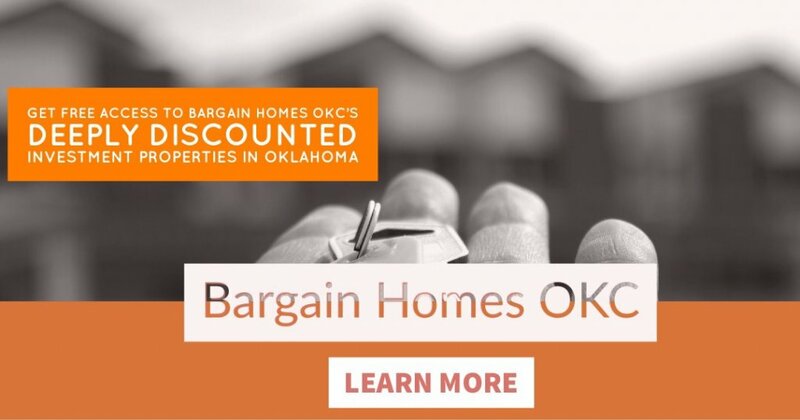 Bargain Homes OKC is the best source for Oklahoma City real estate investors to find great discount and investment property in the Oklahoma City, OK area. We’re constantly picking up new properties and always have properties available. We’ve been doing this since 2013, so we’ve learned a lot about wholesale properties since then. Once you register you’ll be taken to our Oklahoma City investment properties page. Whenever we get new properties in, we’ll put them up on that page and notify you by email. Our Company spends every day looking for the best deals and highest discounts on properties, and then we turn around and offer them to our customers. We help investors like you find great cash flowing rentals, properties to fix and flip, and every other kind of real estate deal imaginable. We market to owners in the Oklahoma City area, then we make lots of offers. Some of them are accepted, and then we’re able to pass along our good deals to local OKC investors who are looking for investment properties. We feel like our deals are much better than the REO properties and foreclosures that are listed on the MLS. Our Company honed our proprietary marketing systems over the last few years and now have a consistent stream of deeply discounted properties, foreclosure properties, distressed property, and other types of real estate. You may have even seen some of the marketing around Oklahoma City. In the end, Bargain Homes OKC invested tens of thousands of dollars into refining our marketing systems to what they are today. You benefit from that by letting us find the great deals and sending them your way. Not a cash buyer? Check out properties offered with owner-financing here.